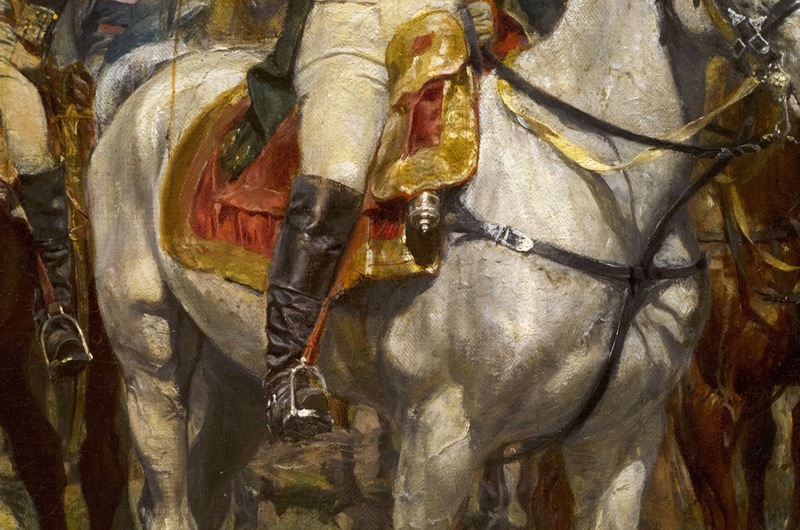 In a previous post, I mentioned the painting Friedland by Ernest Meissonier and that it he painted it over an incredible 14 years. These were not idle years either. Much of the time was spent researching, repainting and restarting. 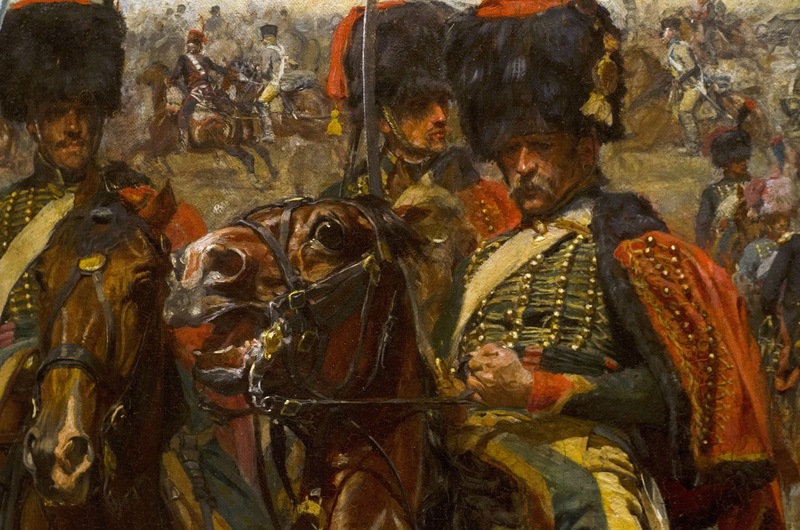 It involved real life cavalry charges, trampling crops, and laying railway tracks. 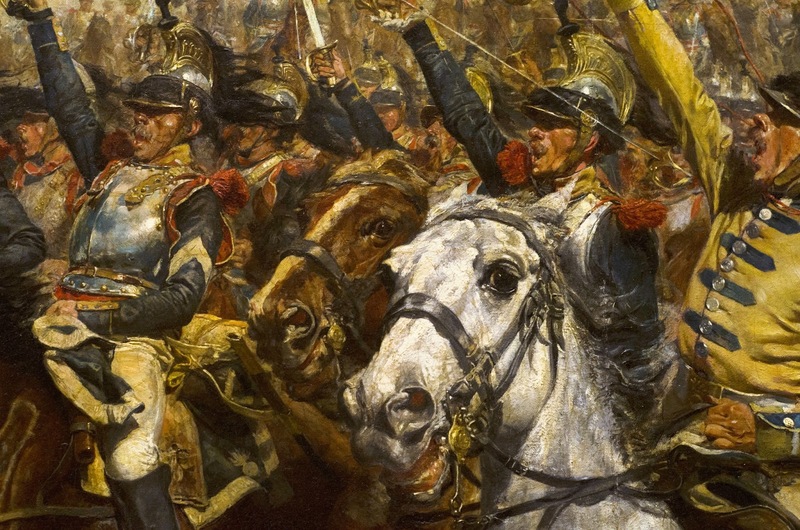 It also took place in one of the most pivotal decades of the 19th century, once which sprouted Impressionism, saw the Franco-Prussian war which laid the ground work for WWI, endured the Communards and witnessed the culmination of academic painting. Fascinating times. 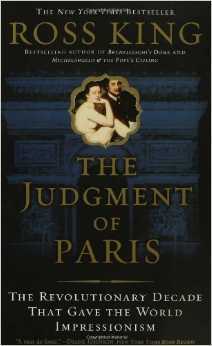 If you get the chance, read the book The Judgment of Paris: The Revolutionary Decade That Gave the World Impressionism by Ross King. It is a very well written book, giving some great insights as to how some quite famous paintings came to be and as well as some important moments in history. I came away with much respect and admiration for Meissonier and Monet, less for Manet and disdain for Courbet. I was also struck by the lengths that the artists then would regularly go to to finish a painting. It was also engrossing to read about the Salons and the weight they carried in the art world as well as the great expositions that drew people from as far away as China to Paris. There is far too much to share here in this post but I will share some details about one painting in particular, Friedland, much discussed in the book. The painting hangs in the Metropolitan Museum of Art, and measures 53.5 x 95.5 inches. 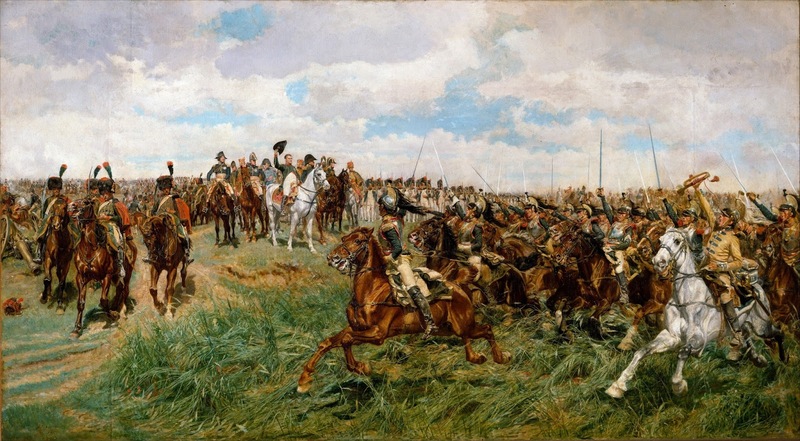 It is not that large of a painting, not in relation to the time it took Meissonier to complete it. He was a perfectionist to the highest degree. 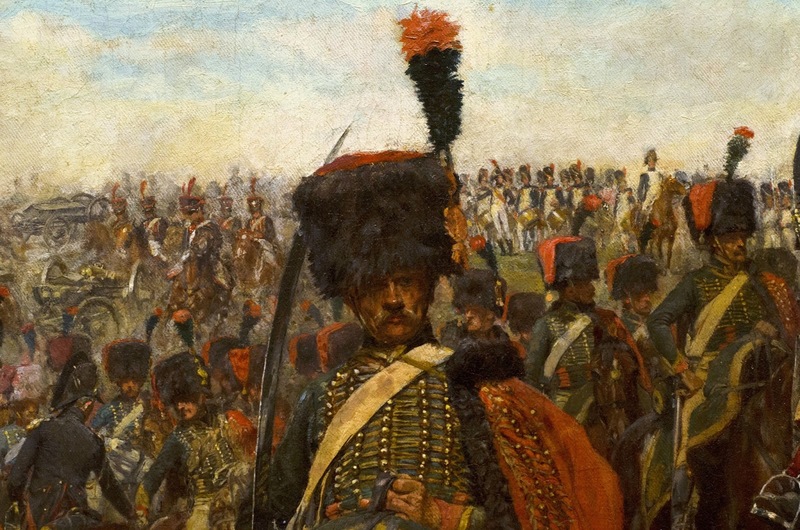 He did massive amounts of research for a piece (he wanted to know what wheat in June would look like when trampled by a cavalry unit, so he planted a field of wheat, waited until the following June and hired cavalry to trample it). 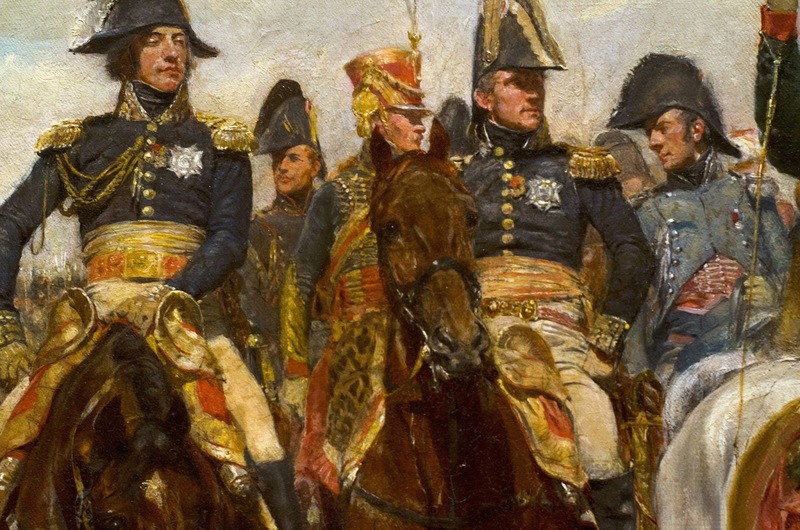 He wanted to know how horses really looked when galloping, so he would gallop along the same cavalry taking notes. When that was insufficient due to the difficulty of making and recording observations while at a full gallop, he had a small railway built on his property so he could sit in a special cart and be pulled along smoothly next to horses while they galloped. The painting was repeatedly scraped down and parts repainted. Portions that were once deemed finished and satisfactory were redone. It was even punctured once by a falling mirror during a fencing match that tore a 3 inch hole in the middle. This wound was dressed and the noble canvas continued it's long march towards completion. It is a remarkable painting. The horses alone show great character and individuality, much more than the charging riders, who all seem to be the same grey mustachioed character. One of the most astonishing things to me about the piece is that much of the brushwork still seems lively and fresh. I would have expected that after so many years of work, it would have been mind-numbingly overwrought. I managed to take some good images of the painting. They are very hi-res, so you might want to download them, or right click and open them in a new window or tab to see the details. 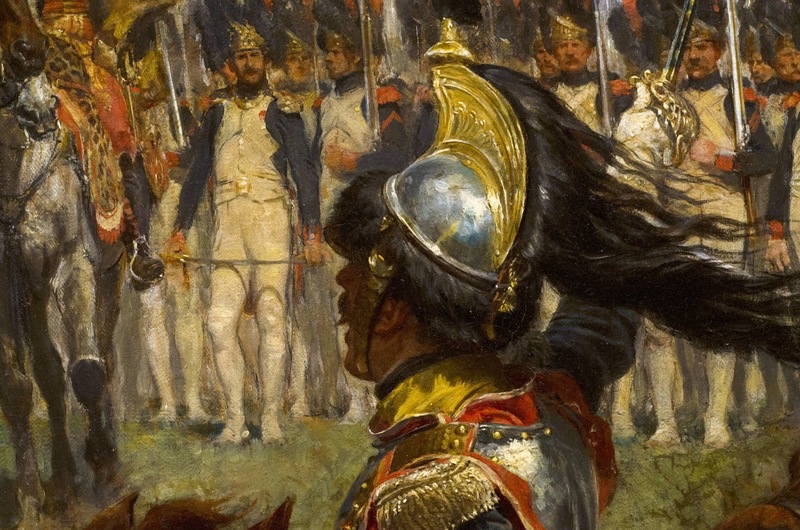 Detail of the much labored cavalry men, cuirassiers saluting Napoleon as they pass. I LOVE this white horse in the foreground. He looks like he is about to speak. Note how all the riders look like the same model, but all the horses have way more individuality. The look might have been part of the uniform, I don't know. I love the detail in the horse tackle here. Tiny wonders, like the twist in the yellow reigns. The metalwork on the buckles is also perfect. It was said of his paintings that they could be viewed with a magnifying glass and that the viewer would be rewarded for doing so. The Ol' Corsican himself, looking dapper and in command. I love these fellows, tons of character in their faces and poses. Awesome. 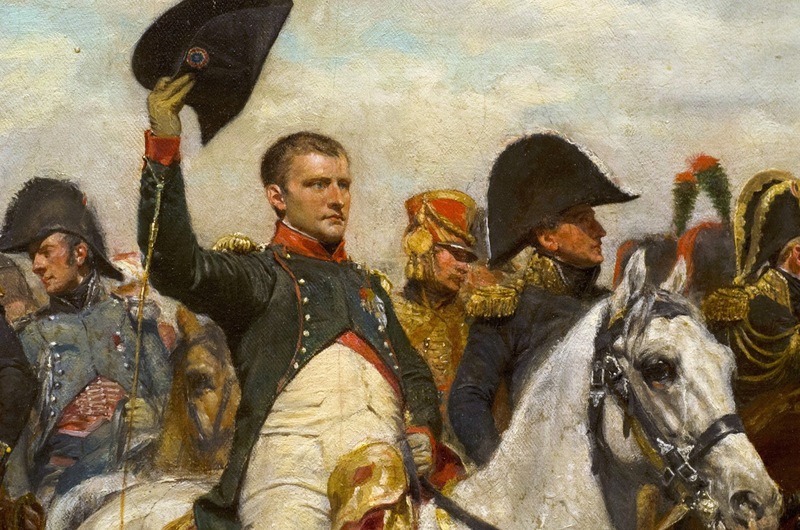 The lacing around those brass buttons and the incredible amount of pomp. I like to imagine that their skulls are huge and the shape of those furry hats. This horse is wonderful. The look of terror in its eyes is so believable. 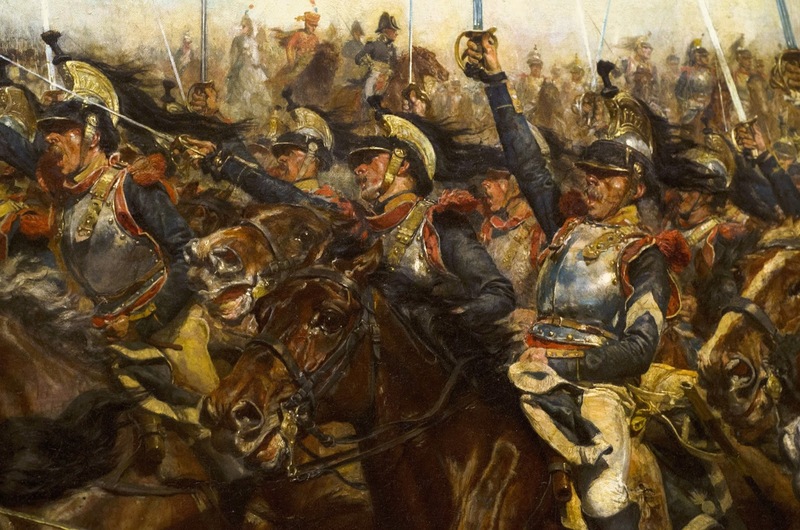 I don't know if it is because of the oncoming charge of cavalry, or that it has held this pose for 14 years while being painted. Look how that rider is pulling the reign in with his pinky. Note how it pulls his other fingers in. I think this kind of detail comes only from deep knowledge and direct observation. 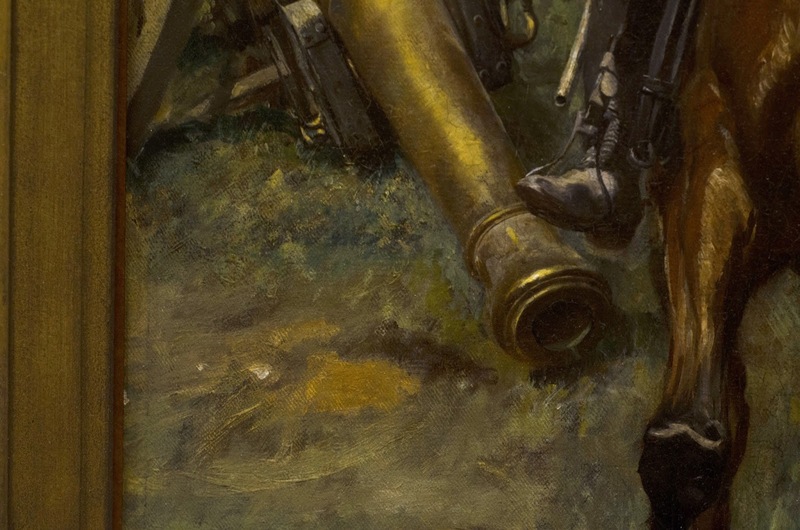 Great details on the cannon and boot. And the final epic painting in all it's glory. I didn't take this final shot, but found it online. I find myself coming back to look at the detail in this painting again and again after reading of the effort that went into it's crafting.